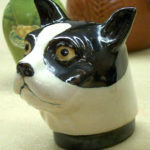 The Roseville Pottery began producing utilitarian earthenware in Roseville, Ohio in 1890. Over the next decade, it purchased factories in nearby Zanesville where production of Art Pottery began around 1900 with the Rozane line. Under the artistic direction of the English potter Frederick H. Rhead, the firm produced several great Art Pottery lines including Della Robbia, Mongol, Egypto, Woodland, Olympic, Fudji, Azurean, and others. 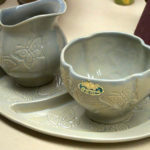 Examples of these seldom-seen lines, as well as samples of the early utility ware, opened the Wisconsin Pottery Association’s 1999 Exhibit. By 1910, the Roseville Pottery relocated its entire operation to Zanesville, where production increasingly turned to molded ware with raised (embossed) patterns. These served as templates for hand painted decoration of the pottery. This technique allowed less-skilled artisans to decorate more pieces, which increased the amount of ware produced, and profits. 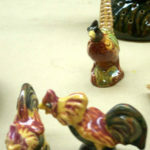 Frank Ferrell created the Roseville pottery that is most familiar and popular to antique lovers today. A Zanesville native and artist at several area potteries, he became Roseville’s art director in 1918, and continued in that position until the plant closed in 1953. Ferrell designed all of Roseville’s Art Pottery during this period, about 90 lines in all. Ferrell sculpted the embossed patterns, designed thousands of shapes, and chose the colors based on ceramic engineer George Krause’s beautiful and durable matt glazes. Almost all of the “Roseville experimentals” for sale at antique malls or on the internet are imposters. Many are routine production items from other potteries, while others may have been cast from Roseville pieces by unknown makers. Genuine Roseville experimentals differ in several ways from ordinary production pottery: the raised patterns were hand-sculpted rather than produced from a mold, most were done on four basic shapes, many had notes and information etched on the blank side, and as such they were either one-of-a-kind, or very limited in number. Ferrell created these experimentals to assess their potential in concrete form. Some patterns were selected for mass production, others were not. One of Frank Ferrell’s greatest creations for Roseville was the Pine Cone line. Introduced in the early 1930s in rich blue, golden brown, and soft green glazes, it was the company’s best-selling line, and may have saved the firm from bankruptcy during the Depression, just as the Donatello pattern reversed the company’s fortunes in 1915. Over 150 Pine Cone shapes were created, the largest number of forms in any Roseville line. A common misconception among beginning collectors is that Roseville lines were produced for one year only; in fact, the company continued making a line, and even adding new forms to it, until sales declined. The Pine Cone line is a good example of this. Pine Cone forms can be found unmarked (they probably had the silver or gold paper label used in the early 1930s), with an impressed mark, and, most commonly, with the raised script mark that was used from 1937 until 1953. This may be evidence that new Pine Cone forms were continually being added to the line. Furthermore, the obvious stylistic and glaze differences in the Pine Cone “400 series” (shapes with raised script numbers in the 400s) may indicate that Ferrell revisited the line in the late 1940s or early 1950s, updating or replacing some of the earlier shapes with the sleeker, modernistic style of the period. 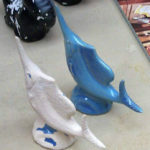 Check out our detailed recommended list of Roseville Pottery books. THE NUMBER AND DIVERSITY of Roseville lines may be confusing (and a little daunting) to new collectors and those with a casual interest, but most Roseville is easily recognizable with experience. Bottoms Up If you want to learn about antique or collectible pottery, always look at the bottom. Notice the clay color, the distribution of glaze, the width and appearance of the rim, the shape of impressed numbers or letters, and other distinguishing features. Learn to associate these features with the maker’s mark and the rest of the pot, and you learn to identify that company’s pottery when the mark is absent. Roseville Marks From 1900 until the late teens or early 1920s, Roseville used a variety of marks including “RPCo,” “Roseville Pottery Company,” and the word “Rozane,” the last often with a line name. The underglaze, ink, script Rv mark was used on lines introduced from the mid-to-late teens through the mid- 1920s. Around 1926 or 1927, Roseville began to use a small, triangular black paper label on lines such as Futura and Imperial II. Silver or gold foil labels began to appear around 1930, continuing for several years on lines such as Blackberry and Tourmaline, and on some early Pine Cone. From 1932 to 1937, an impressed (indented) script markwas added to the molds used on new lines, and around 1937 the familiar raised (in relief) script mark was added to the molds of all new lines. The relief mark always included “U.S.A.” Most Roseville artware was marked when it left Zanesville. Some early artware, and some middle period pieces that had a removable paper label, are unmarked today. One of the special displays in today’s exhibit is the experimental vases. 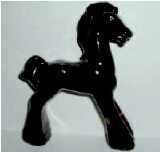 Most “Roseville experimentals” for sale at antique malls or on the internet are imposters. Many are routine production items from other potteries, while others may have been cast from Roseville pieces by unknown makers. Roseville experimentals differ from production pottery in that the raised patterns were hand-sculpted rather than molded, many had notes and information etched on the blank side, and most were done on four basic shapes. Roseville experimentals are one-of-a-kind items created by Frank Ferrell to assess his designs in concrete form; some were selected for mass production, others were not. 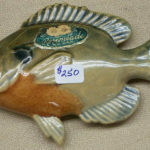 While these rare items occasionally turn up for sale at Art Pottery shows, most are already in the hands of collectors. But it does pay to know the difference. A few years ago, two genuine Roseville experimentals, including the Firethorn on display today, were purchased for under $75 at a rural Wisconsin flea market. It remains a mystery how they got there. 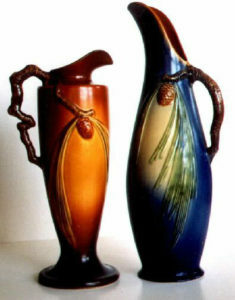 Roseville Trial Glaze vases were often made on standard production forms. 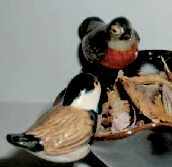 They were used to assess colors and glazes in addition to those ordinarily appearing in the line. Roseville trial glazes can also be identified by lines of handwritten, underglaze numbers and notes on the bottom. (Note. a few handwritten, underglaze numbers are common on ordinary Roseville, and do not indicate a trial glaze piece.) 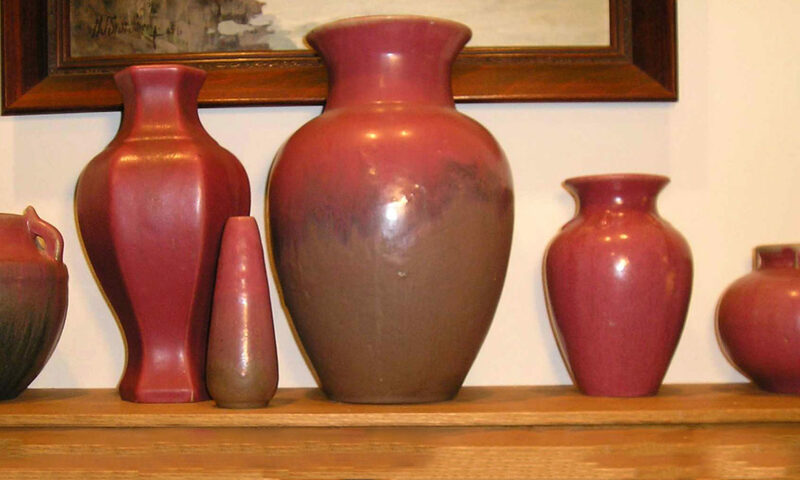 Roseville vases may appear in odd colors without this profuse notation, and the status of these items as trial glazes must be judged on a case by case basis. Wincraft, Baneda, Pine Cone, Ferrella, Jonquil, and Water Lily trial glaze vases appear in today’s exhibit. Robinson-Ransbottom Pottery The Robinson-Ransbottom Pottery Company in Roseville, Ohio is still in operation today. It has used “Roseville, Ohio” in conjunction with “RRPCo” in several of its marks. This ware, often large planters or garden pottery, is often mistaken for the more-valuable ware of the Roseville Pottery Company. The two companies are unrelated. 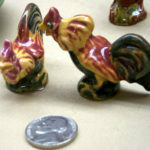 The following article was written for the Wisconsin Pottery Association’s 1999 Show that included the featured exhibit: Roseville America’s Decorative Art Pottery. 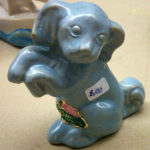 Chinese-made pottery with the last Roseville trademark (a raised in-mold script “Roseville” and a shape number) became available from antique reproduction wholesalers in 1996. The first of these imports had “U.S.A.” in relief, but unlike old Roseville, had unglazed interiors. These pots bear a paper “Made in China” label which is easily removed. This pottery is not made from the original Roseville molds, nor are the original glazes used, and it appears quite different to anyone familiar with Roseville. The first copies were items based on the Magnolia line, but additional lines have since been reproduced. Later imports saw the removal of the relief “U.S.A.,, (or it appears only faintly) from the in-mold trademark. The interiors of recent pots are fully glazed. 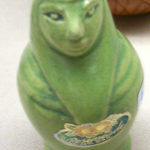 The Chinese-made pottery varies in quality and in how closely it matches original Roseville. The Zephyr Lily reproduction in the exhibit is close, but still can be easily distinguished from the original by comparing the bottoms, while the Luffa, Iris and Jonquil reproductions are poorly done and can be spotted at a distance with a little experience. When marketed as reproduction Roseville, the price range observed in retail shops is about $12-$35 per item, depending on size. Because these items remain in production, there is no shortage of supply and buyers should pay accordingly. These imports, as with other such reproductions, have no interest or value for most collectors or antique dealers. 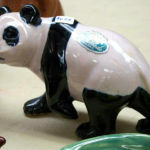 Chinese-made Roseville does appear for sale in some shops, auctions, antique malls, and flea markets with the “Made in China” labels removed. It is sometimes tagged by sellers as “New Roseville” or “Post-1954 Roseville,” or simply “Roseville.” Under these circumstances, it may be sold for prices equivalent to those paid for collectible Roseville to buyers unaware that this merchandise can be purchased in quantity from antique reproduction wholesalers for an average cost of under $10 per piece. Many of the Chinese pieces feel sandy or coarse compared to Roseville, which feels smooth and soft. The Chinese pieces often appear flat and dull compared to the more lustrous Roseville matt glazes. 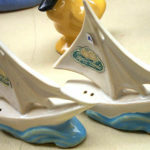 The clay visible on the bottom of imported pieces is white; the clay used by Roseville (and by many Ohio potteries) is yellowish or buff-colored. The color applied to flowers and leaves on imports is often sloppily applied, and runs onto the body of the pot. Flowers may appear to be painted over the background glaze, rather than appearing to be a part of it. Handles tend to be thick and clumsy looking on the imports. The Chinese imports often come in colors not used in the Ohio Roseville lines. For example, Blackberry reproductions come in background colors of bright blue and mint green which were never used in the original line. Roseville Iris was produced in sky blue, tan and pink, but never in green or dark blue. Further, the Chinese imports seem to use a couple of basic shades of blue or green across all their lines while Roseville shades of the same color usually varied across lines. 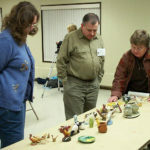 Antique and Collectors Reproduction News – A Monthly Report on Antique Fakes and Reproductions. 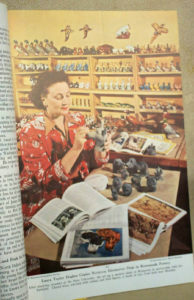 The December 1996 and May 1997 issues had articles on Chinese-made pottery with the Roseville mark. Back issues can sometimes be found on Amazon. Roseville Pottery Historical Marker Video – Dedication ceremony in 2007 in Zanesville Ohio which was brought about by the efforts of the Iowa Art Pottery Association. Peter Flaherty spoke at our February 13, 2001 meeting on Pine Ridge Pottery. Peter gave a very interesting presentation. The following was gleaned from his notes as well as the sources noted at the end of this article. Founded by Mary Chase Perry Stratton, Pewabic has had a diverse history in ceramics. Still in operation, its is one of three Arts & Crafts period potteries in the United States. Pewabic Pottery Founded in 1903 during the height of the Arts & Crafts Movement in America, Pewabic Pottery is today a nonprofit organization dedicated to the preservation of the Arts & Crafts ideals while advancing contemporary ceramic arts through its full curriculum of educational programs, its support of individual artists, outreach to various communities, and leadership in the exhibition of contemporary and historic collections and archiving of scholarly research. This video from the Pewabic Pottery shows the showroom & parts of the production areas. 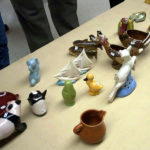 Wherein the WPA’s webmaster, Tim Zinkgraf, becomes the WPA’s intrepid reporter: Tim recently stumbled upon a pottery goldmine on the streets of Detroit! 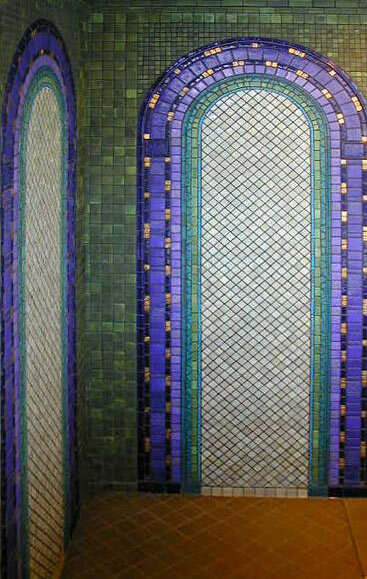 We thank him for this special report on Pewabic Pottery Tiles in Detroit’s PeopleMover train stations. You never know where you’ll find pottery! While looking for information on Detroit and the North American International Auto Show, I was looking at the Detroit PeopleMover web site (Detroit’s elevated train) and something caught my eye. The Cadillac Center Station with tiles from Pewabic. I clicked on a link for one of the stations, which happened, to my surprise, to have tile from the Pewabic Pottery. The tile was in storage for a Stroh Brewery that was never built, Cadillac Center Station or station #11. The pictured to the right is from that station. The following text is borrowed from the above web site: “All of the green tiles you see were actually made in 1935 by Mary Chase Stratton at Pewabic Pottery. The green tiles were commissioned by the Stroh family for a new brewery that eventually was never built. The tiles were put in storage until 1985 when Peter Stroh donated them for use in the Art in the Stations project. The artist incorporated all of the green tiles into her design of archways with the end result being the beautiful murals you see now. All of the tiles inside of the archways are new tiles. However, the artist made these new tiles from historic molds that were made in 1926. In fact, the original workers tiles made from these molds were installed in Northern High School back in 1929.” As noted at the web site, this station was dedicated to tile maker Mary Chase Stratton. The following text accompanies the tiles at Time Square Station or station #1 (picture to the right): “Good example of the historic murals created at Pewabic. Very art deco, but with a modern look. Art Deco is a style of art that was first popular in the early part of this century. Features bold colors and straight lines as well as simple curved lines in the design.